Today I awoke to absolute silence. I’m camped at Hannold Draw in Big Bend National Park which at its southernmost portion borders on the Rio Grande river on the other side of which is our southern neighbor, Mexico. Hannold Draw is more centrally located in the park, about 5 miles north of Panther Junction where one of the park’s five Visitor Centers is located–it’s a sizable park. View along the Lost Mine Trail, Big Bend Nat’l Park, TX. This hike is about 4.8 miles round trip with an elevation gain of 1,000′. There are wonderful views along the way and it runs through habitat much different than desert below. Sitting at my dinette and looking out the window to the south in the immediate foreground is desert with typical desert scrub. There is also a bit of construction stuff–concrete highway barriers, piles of dirt and gravel, a piece of heavy machinery–largely hidden behind the scrub due to my strategic selection of a parking position. In the distance my eyes are treated to a view of part of the Cheetos Mountains. That’s not really what they are called. They are the Chisos Mountains, but wouldn’t it be funny to be eating Cheetos in the Chisos? No? Well, OK. The sun, now just rising, rakes across the northern slope of the mountain range creating contrasted areas of shadow and light, chiaroscuro as it is sometimes called in the world of art. It’s the time of day photographers live for, or would die for. (Make up your minds you silly photographers!) 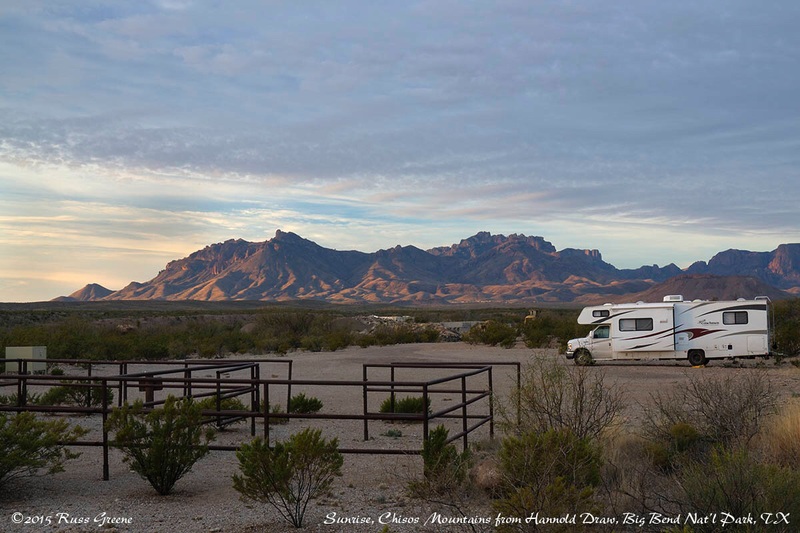 Looking out the other side of my RV to the north is a horse corral, beyond which I can see desert scrub and mountains not as picturesque as the Cheetos, umm, err, Chisos. 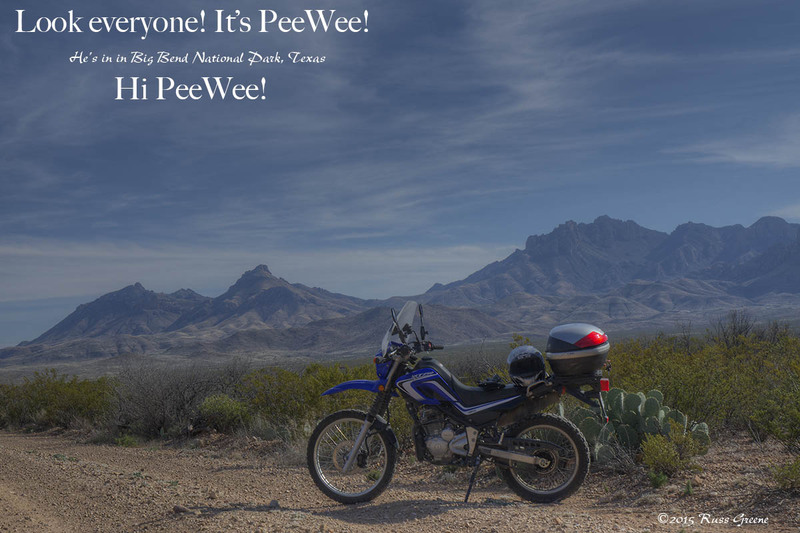 PeeWee poses in front of the Chisos Mountains, Big Bend National Park, Texas. This shot was taken along the road to the Paint Gap primitive campsites. The spot where I’m parked is about two tenths of a mile down a dirt road off the highway 385 which enters the park from the north. The park has designated this spot as a primitive campsite for one. I guess by one they mean one rig or one party. The park has a number of primitive sites but only a very small number that can accommodate RVs of any real size. I think Hannold Draw probably has the easiest access of any of them. I booked two nights here followed by 3 mights at Paint Gap 1 which was the spot I originally wanted but which was unavailable on my first choice of dates. Reservations for the primitive sites can only be made in the park at one of the Visitor Centers. When I arrived the only suitable spot for me was Hannold Draw so I took it and booked Paint Gap 1 for 3 nights at its first availability. I may change my plans if I can and remain at Hannold because Paint Gap 1 is something like a mile up a dirt road which could be problematic when wet or snowy and there is precipitation of one kind or another in the immediate forecast. I came across this one tree seemingly growing out of the rock at the top of the mountain while hiking the Lost Mine Trail in Big Bend National Park. 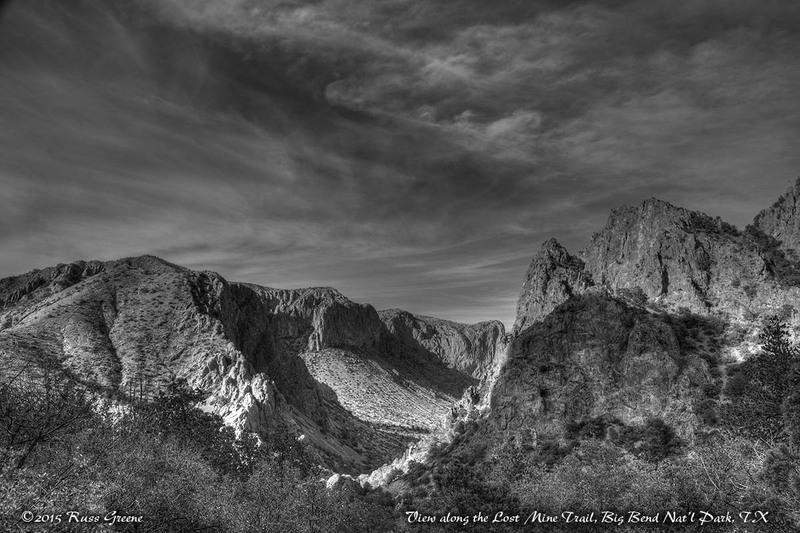 Big Bend takes its name from, well, a big bend in the Rio Grand River which defines the park’s southern border for 118 miles. It lies at the northern end of the Chihuahuan Desert which at about 8,000 years in age is geologically but a newborn. I struggled for some time trying to pronounce the name of the desert until I realized it sounded like the little dog, Chihuahua. This desert is home to many species of animals and plants. Besides bear, deer and cougar (another name for panther or mountain lions) the park is home to Golden Eagles, Coyotes, Jackrabbits, Kangaroo Rats, and over 450 species of birds either reside in or migrate through the park making it a favorite destination of birders, so I’m told. Oh, and let’s not forget the snakes and reptile species totaling 59. There are four species of rattlers alone and a slew of other creatures, among them 3600 kinds of insects. Some of the animal inhabitants of the Chisos mountains were stranded here as the cooler climates surrounding the mountains retreated northward leaving them no suitable habitat except for the mountains. I loved the rich red colors of this butte near Catalon in Big Bend National Park, especially set against the rich blue of the sky with its beautiful white clouds. 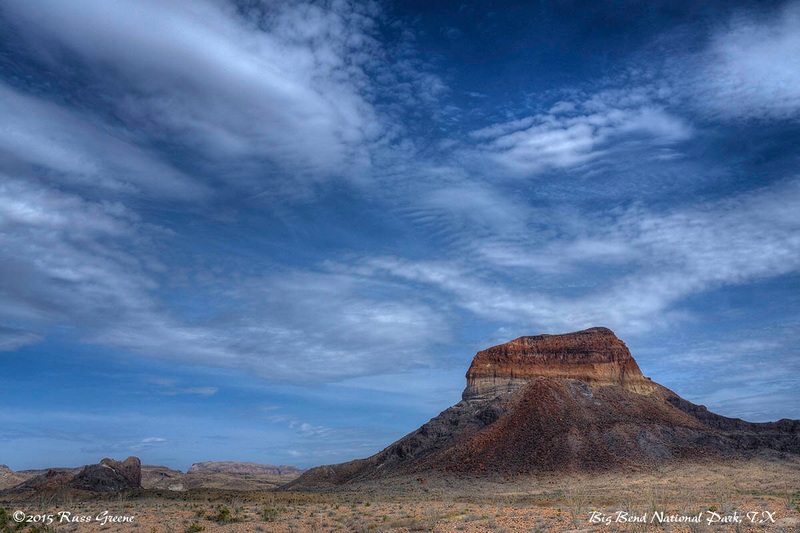 The Big Bend area was inhabited by ancient peoples as long as 10,000 years ago but little evidence of the area’s inhabitants predates about 8,000 years ago. More recent history includes the presence of the Spanish, Comanche, Apache, Mexican and Anglo-American. 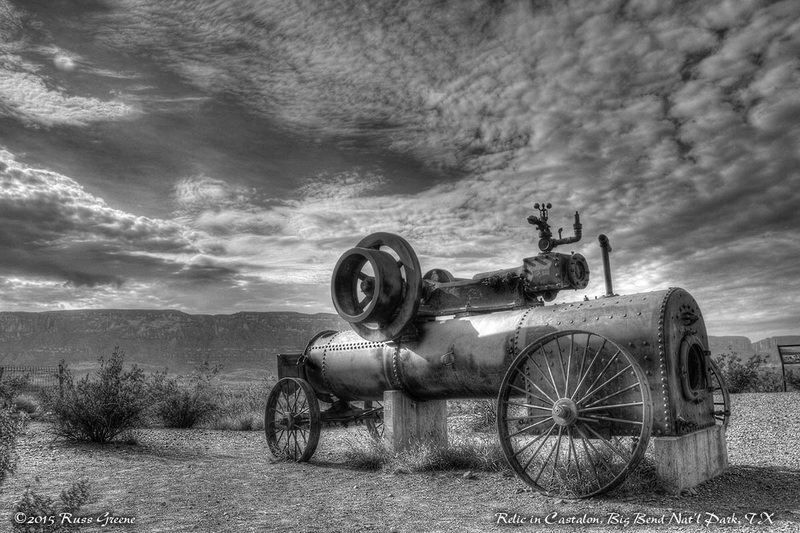 I’m not sure what this machinery relic was used for when many years ago Catalon, TX was a town where people lived and worked. There was some cotton farming there for a while, I know that. Yesterday I went for a hike along the Lost Mine Trail which climbs 1100′ in the heart of the Chisos and provides sensational views of the surrounding country. Signs warn of bears and mountain lions and not to take small children up there. The round trip hike is 4.8 miles and takes about three hours. Of course that can vary a lot depending on your physical condition and propensity to lollygag. Today I’m planning to motorcycle down to Castalon in the southwest corner of the park. I’m told the drive along the Ross Maxwell Scenic Drive is, well, scenic. Never thought there were mountains in Texas of all places! Is Charlene running as well as before your hit&run accident? With all the wildlife big and small in this park I’m sure you are happy to be in an RV. Are you not tempted to go to Mexico for a side trip to try some delicious tamales? Charlene seems fine. Thanks for asking. The tamales will have to wait for my next trip. There is a border crossing in the park if I recall correctly. Meanwhile, I’m now in New Mexico hoping to visit White Sands National Monument tomorrow. I expect I’ll post a boondocking report on Hannold Draw soon. I’ve already started work on it but sheesh, there’s just so much that needs doing apart from blogging! Too bad I didn’t have a chance to catch any of the ranger programs. Things were a bit messed up whn I was ther due to a power outage that lasted a week or so. I would have stayed anoher day or two were it not for the weather. The day I decided to leave it was in the thirties with light drizzle. Not a good combination for motorcycling! I’d contemplated taking River Road from Catalon over to Rio Grande Village, making a loop trip, but when I heard it was sandy I said no thanks. 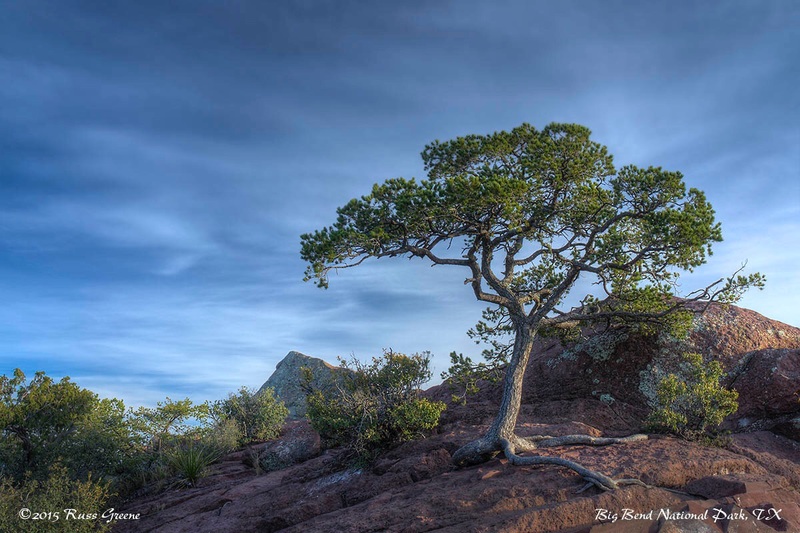 Thanks for the review…your landscape images and subject matter is much appreciated.